The Rev WEALANDS BELL saw his church turned into a theatre last week for the world premiere of a play about the artist Cicely Mary Barker. 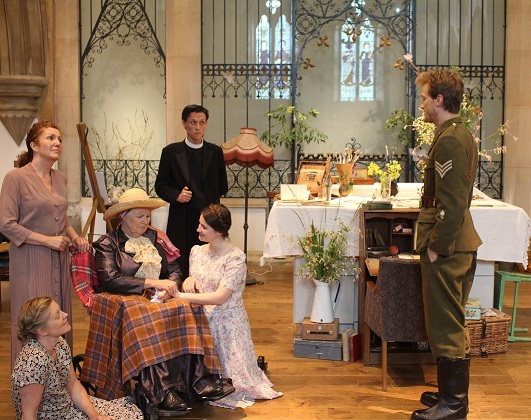 This was the first time that David Matthews’ play, Under the Shadow of Your Wings, had been performed by professionals, and the first occasion in which the recently re-ordered church has been used as a theatrical space. One of the great pleasures of seeing the play staged was to experience how well the building lent itself to dramatic performance. It was possible to accommodate and absorb into the set even the enormous stone altar in the middle of the performing area. The uncluttered and simple space, minimally decorated, was the ideal backdrop to dramatic performance, and the unpretentious set (representing Cicely’s studio in the garden of the family home in the Waldrons) was highly effective. South Croydon resident Matthews is, for a week or so more until he takes early retirement at the end of term, the head teacher at St Andrew’s High School. His deputy, Tanya Kirk, is a highly experienced musical performer, and she played some originally composed piano music and her arrangement of other pieces of the period to help set the scene and establish mood as the story unfolded. And as the natural light faded through the summer evening performances, it was good to see that the relatively simple lighting arrangements were sufficient for the building and its work. Perhaps most thrilling of all was the sense of being in the very building in which Cicely spent so much of her time. When we heard the sound of the bombers overhead, we were aware of windows in the church dedicated to the memory of those Croydon residents who had perished as those same bombs fell. Hearing her words and seeing her work was, in this building so precious to her, as close as we could get to Cicely Barker. In that regard, the play has a sacramental quality. Its author describes the play as a work of fiction only inspired by the paintings of Cicely Mary Barker, but it tells with complete credibility the story of the tense relationship between Cicely, her sister Dorothy and their mother Mary, as the three women continue after the death of Cicely’s father to live on in circumstances with which Mrs Barker is never entirely satisfied. 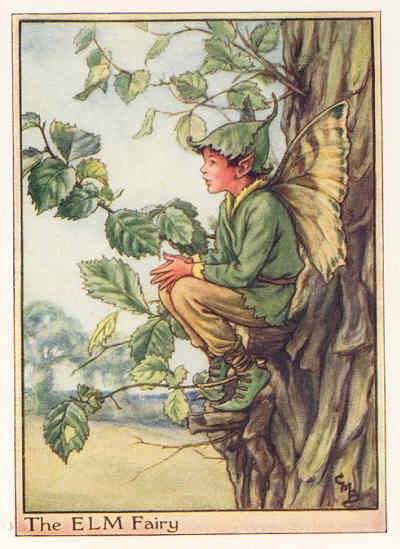 Whereas Cicely’s sister is never content with her painting, always wanting her to stretch herself further and to explore the darker side of human experience, their mother is concerned only that the flower fairies should be lucrative. Occupying the space between these two very strong women, Cicely could easily have been crushed, but she retains a strong sense of her own identity; even after the passage of 30 years’ narrative, she retains her own indomitable and childlike personality, sorely tested in the face of her sister’s intense bitterness. Having declined marriage in her youth in order to dedicate herself to her mother and her sister, Dorothy ends up complaining that her “life has been so uneventful that it might never have happened”. 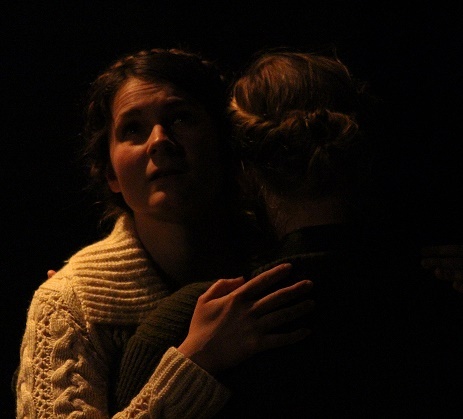 Her death in the final moments of the play is a warning to us all of the debilitating effects of bitterness on the human character. Many of those who saw the play might struggle to choose between Dorothy’s sense of futility and Cicely’s refuge in poetry and paint. But most of us have to come to terms with the essential modesty of our lives which, in an age of celebrity, can be a difficult pill to swallow. Perhaps Cicely’s answer is found not even in her work, “Out Of Great Tribulation”, which now hangs a few feet from the “stage” in the church, but in the painting that hangs in St George’s, Waddon. “The Parable of the Great Supper” does not seek to minimise the ordinariness of the lives of the people of Croydon, but shows how these lives, when caught up in the beauty and the truth and the grandeur of God are transfigured and given their fundamental worth. The painting expresses our human value by showing us at the table feasting in the divine presence for all eternity. It is of this feast that we are given a hint and preview, a sort of first instalment, every time we follow the footsteps of Cicely Mary Barker to the altar in St Andrew’s Church. And you will still find those who sat for Miss Barker as children, including the man baptised in her font almost 80 years ago, and who still remembers the cake and lemonade with which her young models were encouraged and rewarded. It’s been a good few months for Barker, Croydon’s 20th-century artist of angels, flower fairies, and so much more. After St Andrew’s received the 1949 work, “Out of Great Tribulation” on loan from Croydon Museum last autumn, in the spring we heard news of the flower fairies garden being developed by an energetic team of volunteers in Park Hill Park. This led into the recent festivals of the summer. 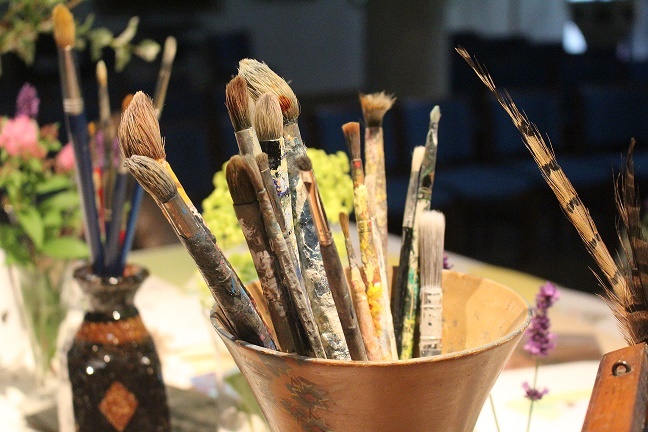 It was especially good that Croydon’s children, the successors of those whom Barker has immortalised in paint as her flower fairies, were able to participate in a variety of activities and pieces of work appropriate to our artist. And then came the play. John Harries Rees is to be congratulated on this production, as is its young cast. The audience, including some very young members of the congregation, were drawn into a highly rewarding experience of theatre, and into the life of this woman who has had such an influence on all who have made St Andrew’s their home in the years following her death. It was good to have seen the first fruits of David Matthews’ public art, and the whole community will hope that in his retirement from school life he will be able to dedicate himself to further artistic pursuits, as well as continuing to support the church and its charity. This entry was posted in Art, Church and religions, Cicely Mary Barker, Schools, St Andrew's, Theatre, Wealands Bell and tagged Cicely Mary Barker, South Croydon, St Andrew's Church, St Andrew's School, Waddon, Wealands Bell. Bookmark the permalink.